Germany is Europe’s largest economy and after Russia it’s also Europe’s most populous country. After World War II Germany was divided into two different states: West Germany (officially called the Federal Republic of Germany) and East Germany (the German Democratic Republic). The western part sought established links with other Western European countries, while the communist GDR was more connected with countries like the Soviet Union, Hungary and Poland. As of July 2013 it’s estimated 81.1 million people live in Germany, of which 42% is between 25 and 54 years old. Every year there are several ecommerce events being organized in Germany. We have a handy ecommerce events calendar, where you can find all the major online retail events in Europe. But you can also check out only the ecommerce events in Germany. Online shoppers in Germany (47 million in 2015) are keen on using invoice, as it is their preferred online payment method. According to a 2013 survey almost six in ten online customers in Germany pay afterwards whenever they ordered something online. But it’s not only invoice that’s popular, 34% of the German customers use credit cards (MasterCard, VISA or American Express). Other often used online payment methods are PayPal, ELV, GiroPay, Sofort Überweisung , RatePay and cash on delivery. 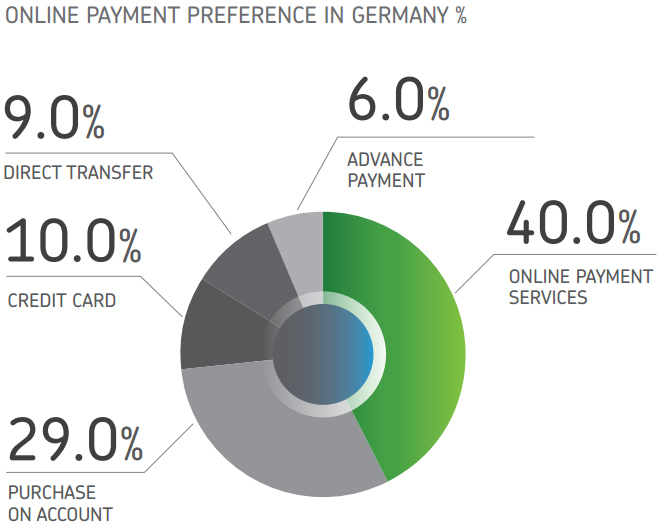 Online payment methods in Germany, according to Payvision. Another study, one from BITKOM, suggests that with 63% invoice is the most important payment method in Germany, followed by online payment services such as PayPal (56%), debit (46%), credit card (29%), immediate transfer/Giropay (26%), payment in advance (24%), cash on delivery (9%). Online fashion is the most popular product category in Germany, followed by consumer media and electronics. Especially in the categories ‘consumer electronics & computers’ and ‘media’ (books, music, movies, video games) German consumers are more keen on shopping online instead of shopping offline. According to a study from BITKOM, 65% of German citizens have shopped online during 2012, up from 53 percent in 2008. The current European average is 45 percent. In Germany, 85% of the people have access to the internet. Germany is known for its high return percentage. Some reports claim that 50% of all orders gets sent back. This is important to know if you want to do business in Germany. More tips for ecommerce in Germany can be found at EcommerceWiki. In May 2016, the Ecommerce Foundation shared some interesting statistics about ecommerce in Germany. The market was worth 59.7 billion euros in 2015 and is expected to reach 66.9 billion euros in 2016. And wwd.com thinks it’s expected to grow 12 percent yearly through 2017, faster than any other Western European country. 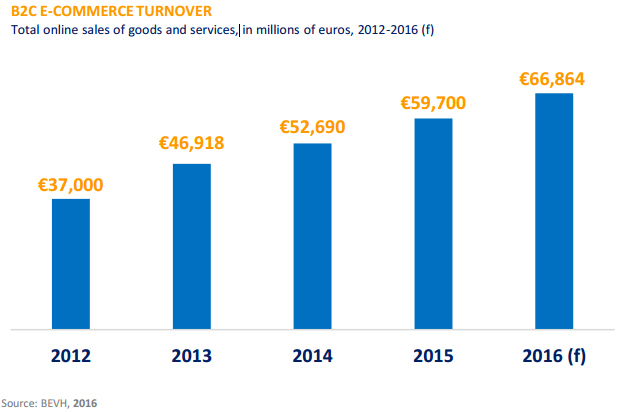 It’s expected ecommerce revenue will account for 53% of the total gross domestic product in Germany by 2017. The estimated share of online retail in Germany in total retail is 6,6% at the moment. And according to a study from Deutsche Card Services, the east-west difference in German online retailing has vanished. In terms of purchasing activity nowadays there is virtually no disparity between the western and eastern parts of Germany any more. And data from the Centre for Retail Search shows us that online sales in Germany account for 8% of total retail sales. Ecommerce in Germany seems all about two big players: American retailer Amazon and German-founded Otto. They own almost half of the online market, so it’s pretty clear that it’s quite hard for smaller merchants to make a difference. The 10 largest online retailers in Germany, by turnover in 2015, are: Amazon (€7,790 million), Otto (€2,300mn), Zalando (€1,031mn), Notebooksbilliger.de (€610mn), Cyberport (€404mn), Bonprix (€484mn), Tchibo (€450mn), Conrad (€433mn), Alternate (€376mn) and Apple (€369mn). April 19, 2019Picnic, the online-only supermarket from the Netherlands, launched its business in Germany one year ago. Now, the ecommerce company is already profitable in two German cities. In Mönchengladbach, the supermarket makes even more revenue than at the best location the Netherlands. April 17, 2019German ecommerce company Otto is the biggest competitor of Amazon, and the only European alternative to this American ecommerce giant. At least, that is what the former CEO and current chairman of the Otto Group supervisory board, Michael Otto, claims. March 26, 2019De Bijenkorf, a high-end department store chain from the Netherlands, will soon open an online store in Germany. The retail company will start with its German ecommerce website somewhere during the summer. March 19, 2019Shop Apotheke is aiming to grow from 540 million euros to over 700 million euros this year. The online pharmacy wants to achieve this without any major acquisitions, but it does want to launch an online marketplace. Read all our articles about ecommerce in Germany.